Well from watching star trek (Sorry, I am a Sci-Fi fan) we have just found links to these classic and funny tunes. The Phantom Screwgate the Lightest Screwgate Carabiner in the World. Well a few weeks ago I mentioned the wild country claims at lightest carabiner in the world. 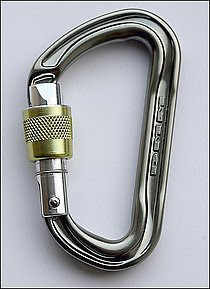 However I also mentioned that DMM were about to launch the even lighter than that carabiner. The Phantom Screwgate is an amazing 41 grams, and comes with the usual DMM flare for ergonomic design. As the originators of the I-beam construction technique in carabiners, it is only fitting that the mantel of ‘lightest …. in the world’ comes back into the hands of one of the worlds leading designers and manufacturers of climbing equipment. I might sound a little in the paid service of DMM, however whilst I have received goods of them in the past, I haven’t done for some time, however as a local to Llanberis I feel a strong bond towards a company that employs so many villagers, they have also helped put a positive spin on Mountaineering long before Snowdonia-Active published their report into the Adventure Tourism Economy in North West Wales. As such I see DMM as a spearhead of manufacturing achievement, who have manage to sucessfully avoid ‘out sourcing’ manufacturing to the far east. Instead a totally modern factory by the shores of Llyn Peris house the hardware for state of the art hot forging. Whilst DMM have a Premiere post on UKC, I couldn’t find a mention of this amazing feat of engineering on their website (but didn’t look very closely, I also haven’t started Twittering). However its my belief that it will be available in V12 and Joe Browns already (they both take all major credit cards!). Interestingly DMM have some new products in the form of some brass micro wires based on the old HB offsets, as well as some based on the RP design, as well as some large protection in the form of DMM version of the Hex, have seen these bits of kit they look as versatile if not more than the Rockcentric (I can’t wait to try using them outside), and has a great sling feature that I am sure Wild Country will R&D (rip-off and duplicate) into their own range large passive protection. If you’d like to see the kind of love, care and attention that is put into the making of all DMM’s beautiful equipment then either look at my video from a few years back or better still Dave Gills more recent offering. The making of a carabiner @ DMM Wales from Dave Gill on Vimeo. The Secret Life of Krabs from mark reeves on Vimeo. Well, I am a porridge man myself, when it comes to breakfast, cheap, reasonably easy to make in the old popty ping (Oven that goes ping! ), and really nice with lashings of Tate & Lyle’s golden syrup, aka treacle. It is the stuff of champions treacle, I have been raised on the stuff for years, so imagine my amazement when I went to buy some in Spar Llanberis and there wasn’t any. I would say it was a shock, but the shop seems to have a form of dietary telepathy, when it comes to stocking what I would like to cook for dinner. Generally the idea is to go in there open minded and see what they have that you can consider calling a dinner. If you were a local and didn’t have transport to get to Tesco, then your diet would probably be insufficiently diverse, and lead to some form of vitamin deficiency through an over load of excessively process foods. The diet of Llanberis is not the point here so I will move on. Despite there not being any Golden Syrup there was a large jar of Black Treacle, which given the hour of the day, and the immediate need for my breakfast was the best solution to my problem, given that the Honey had already crystallised on the shelf. So I set off home with my mysterious black treacle, 2 pints of milk and some Scottish oats. Excitedly I get home and go through the usual ritual of making myself a pint of expresso, whilst the porridge pirouettes in the popty ping. 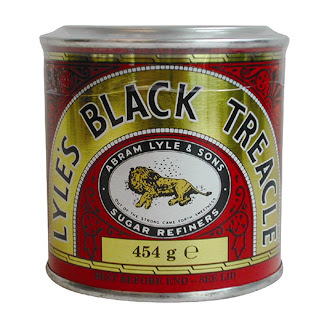 As I open the jar of what can only be described as tar, I start having doubts as to black treacle’s similarity to good old golden syrup. As I stir the tar into my porridge, it turns a rather unpleasant colour. Only when I take the first mouth full do I realise that this is most definitely the wrong treacle for my porridge. I would say it tastes like tar, but never having put tongue to tarmac I can’t really say. Away if someone would like a jar of Black Treacle or if you have a recipe for something actually edible you can make with it then I would love to hear from you! I don’t often cry, I think it was something that I wasn’t encouraged to do as a child and have just kept up the pretense, some might describe me as an emotional vacuum. Ocassionally though in quiet times when the right or wrong things happen in my life I do cry, I know grown men aren’t meant to but I guess at times I connect with my feminine side. Today I didn’t so much cry as a shed a tear, when I received a group email from the rescue team and despite not even being on the rescue in question, found the letter from the family rather emotional. There were aspect of it that really touched a nerve with me as a climber. It was said from the heart of someone who knew and understood a mans passion for the outdoors. I wasn’t going to share this sombre moment, but its part of my life, and part of being in a rescue team. Anyway I give you one of the most prudent pieces of advice and solace from Edward Whymper who after the Matterhorn tragedy In 1861 wrote. This quote adorns the inside of the main entrance to Plas Y Brenin, I often reflect on these wise words as I past. Well, today I was meant to go to Jerry’s Roof with Kate Forrester, however the morning was a little damp so I convinced her that I was way better to go to the Beacon for an indoor session, plastic is fantastic after all, and besides who wants to hovel under a boulder in the cold, only to flail miserably up the same problem that I have already done, albeit the once! So instead we went for a boulder at the wall and started knocking out a few of my uber-link ups of the problems. After a fairly exhausting power endurance session it was back to my house where I fed Kate some proper Shepherds Pie, made from real Welsh hill farmers. Yum! We had a good rant off, on the way back based loosely around the economic down turn and with me fight the corner of how basically government and capitalism has failed us. So what is there left for us to do, other than to start nationalising all the failing businesses just to create both jobs and stimulate the economy into a situation where people can afford to buy even the most simple of ‘luxury’ items. I did go on a bit and laid into the fat cats at the top of the food chain, saying that I would vote for any political party that campaigned under the manifesto that they were going to remove the Chairman of RBS’s> £650000 per year Pension. I mean, just what is he going to spend that on? It might keep him in hookers for a few months, buy several houses a year but other than giving his children if he has any an easy ride what could he actually spend it on? Who in there right mind needs that amount of money to retire. So if someone says they will reduce it to an acceptable level I am all for it, I might even actually make the effort to vote. Something that in my 33 years of apathetic living I have yet to do! In fact I am all for banning the concept of a bonus, as far as I can see, most of these bankers have totally ruin the global economy, yet still get a nice £100000+ thank you for their mess. In fact how do people justify such astronomical wages as these sectors. In my experience the more money you get paid the less actual work you do! I have several uncitable examples based on local observations. Am I becoming a socialist, communist or another kind of Marxist freak? 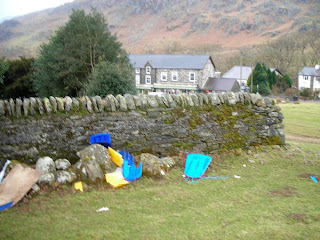 Debris from the Snowy patch a few weeks back, if only people could be arsed to take there litter home! 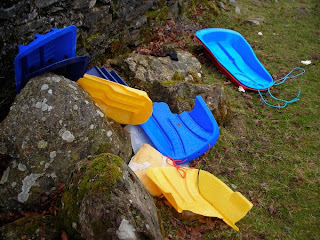 I was out with a Mountain leader training group group today, working out of Plas Y brenin, on my way back i headed past this wall, only 100 metres from the road but obviously too far for any self respecting parent or child to carry there broken toboggan. I was just flabbergasted, in fact if those type of people are the typical hill user its is not a surprise that it took so long to get open access, and if everybody behaved like that then I am not sure we deserve that access. I go past this place a lot at work, so will endeavour to arrange to bring it down off the hill if it is still there the next time I pass through. 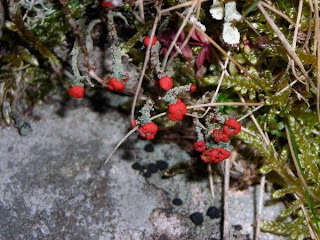 I took some more photos today, but put them up on my coaching blog as they are more suited for budding Mountain Leaders. Well I know that this is a climbing coaching blog however due to my work from time to time I do a few post that are more relevant to instructors, coaches or in this case Mountain Walking Leader, who as part of there course have to know things about the environment. 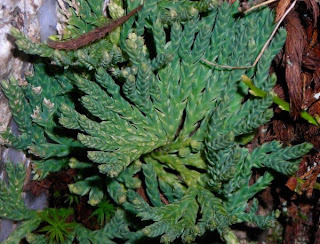 Whilst this is a broad subject, today whilst I was teaching a group from Coleg Menai at Plas Y brenin we look at what plant life we could see on our way. We saw quite a lot, so these are the pictures of what we saw on out day out on the hill. 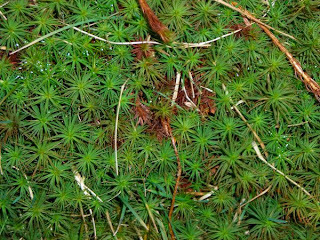 Star Moss – Its a moss that has a starry shape! 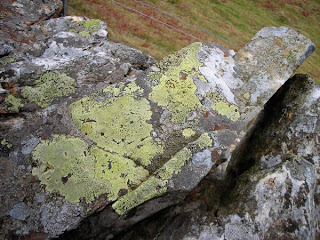 Geographicum (sic) looks like a map – aka Map Lichen. 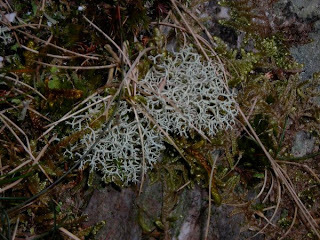 Lichen is a symbiotic relationship between Algae and Fungus. 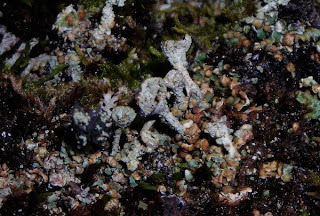 The fungus beds itself to the rock, and the algae roots itself to Fungus and photosynthesises providing energy. 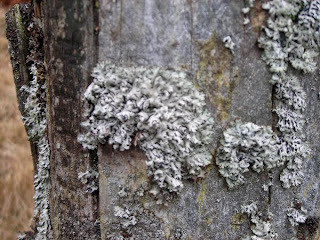 Loose leaf lichen – likes wood, but will grow on rovk, has lots of loose thin paper leaves. Hence the name. The Devils Match Stick – Looks like and old non-safety match. 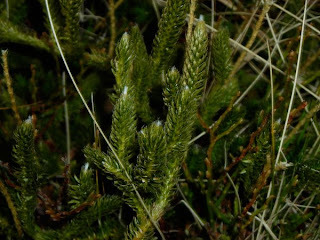 Club moss – a slightly larger version of the alpine club moss. Looks like a mini club. Well I have not been running that long but I manage to knock a few minutes off my lap of Llyn Padarn, the lake that Llanberis sits on the shores of. Perviously I had made it round in one go, which felt like a massive effort, however setting faster and faster times seems addictive, as you can constantly aim to improve, unlike climbing where improvements require an entire grade jump, something that isn’t always possible every time you hit the rock! However whilst my 47 minutes round the lake is good for me, V12 Jim has been rumoured to knocking out a lap in 36 minutes, now I can see where I can take a minute or two off, but over ten minutes? Jim your a beast! Anyway I got accosted by king of climbing runners Dr Craine, who has sign me up for some hill sprint training. I am not sure what it entails exactly, but I am thinking hills, heavy breathing, plenty of vomit and feeling close to death. When a friend was ask about hill sprint training the good Doctor simply said its horrendous! So I have that fun to come, I am sure to keep you informed about the whole experience. Posted on 26th February 2009 Categories UncategorisedLeave a comment on New PB! Now probably for the last 10 years or more I have survived on what can only be described as charitable donations to the Mark Reeves climbing lifestyle. Much of my time I have merely worked to live, not lived to work, as such much of my technical equipment and clothing have been acquired through friends who thought the garment so terrible that they no longer wanted it. I have for instance a bright orange down jacket that Jim Hughes donated, for a while I wore Leo Houlding’s Berghaus off casts, which was a fashion highlight of my life, as he renewed his wardrobe about twice a year, similarly, I have got old boots of other climbers, and a few years back I got a rack of DMM for making them a video. Recently though I have had a couple of well very well received garments for the ‘Reeves Active collection’. In a way I see it as a form of recycling, in that rather than send it to a charity shop, you can instead give it to me and see the benefit I get from it! My latest addition was a very nice new pair of Mountain Equipment Ibex Pants donated by my housemate, as they were too small for him. Having been on the hill several times in these they are a great addition for mountaineers closet. I also got a new fleecy jacket from the same source, whilst second hand, I have barely been out of it since. If Gorillas were blue then I would look like one! However they aren’t, but at least its kept me warm in one of the harshest winters for a few years. If that wasn’t warm enough I also got hold of a nice new Mountain Equipment Fitzroy Belay Jacket, now this is the stuff of champion’s not only warm, but the pockets are fleece lined. I mean you just don’t get that detail in most clothing. I swear if you put your hands in my pockets you’d get pocket envy, come to think of it I don’t want your dirty mitts in my pockets. Anyway I can recommend the ME clothing, as real mountaineering kit for real mountaineers. Although saying that I am not sure I count as a ‘real’ mountaineer, as I could be bothered to go out in the winter conditions we just had. Too much like suffering! 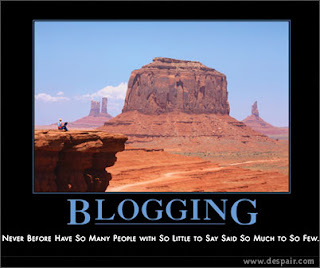 Posted on 26th February 2009 Categories UncategorisedLeave a comment on Beggars can’t be chooser’s!